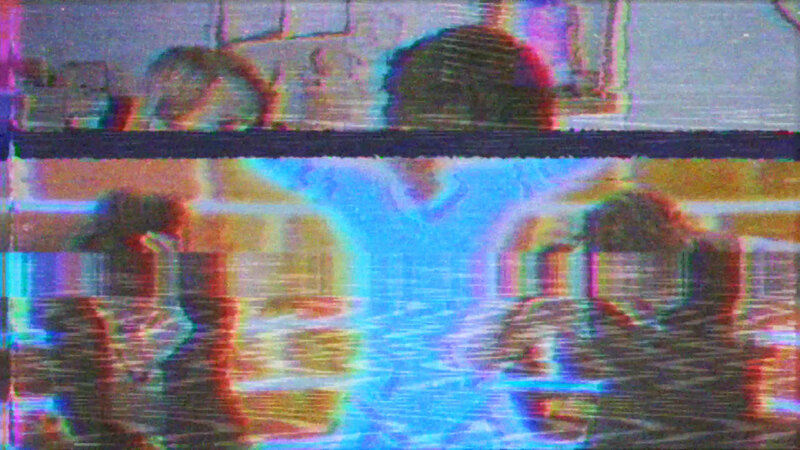 Distort from one shot to the next while mimicking the look of a VHS tape that's been recorded over. Transition Type determines the overall movement between one shot to the next during the transition; it can Slide Down (default) onto the screen, or Slide Up, there's also the more subtle Wipe effect, or the comparatively blunt Cut. Tape Noise Type controls the stylization of the VHS noise: Color Noise, Bad Tracking or Very Bad Tracking mimics the look of old VHS players which had a hard time syncing the VHS reel (resulting in a visible stuttering), or Degauss which creates the look of a monitor resetting its color palette. Tape Noise customizes the amount of noise covering the shots during the transition. Tape Distortion adjusts how skewed the overall shot becomes using a banded distortion method akin to tapes. Random Noise controls a secondary noise amount that flickers on and off the image. Stroke contains toggles and adjustments for an optional stroke visible between shots. Enable Stroke toggles whether the stroke is apparent. Width adjusts the diameter of the stroke. Color changes the stroke's color using an eyedropper or swatch. Wrinkle Distortion toggles whether the tape's wrinkle distorts the image as it passes. Wrinkle Size modifies the diameter of the wrinkle, capping out at 20% of the shot. Color Controls contains adjustments for each of the color distortions performed during the transition. Red, Green, Blue Offset controls the distortion of the position of the respective channels on a horizontal axis; for example if you move Red Offset into the negatives, you'd see the Red Channel move to the left; alternately, moving it into the positives moves it to the right. Red, Green, Blue Blur determines the fuzziness of the respective channels. Black Level adjusts what the color adjustments considers Black. Higher results in a brighter looking image, lower results in darker (down to whatever the original shot considers Black). Saturation controls the intensity (or lack thereof when set to 0) of the collective channels. Luminance Blur adjusts the fuzziness of the luminance/brighter parts of the image. Chroma Blur customizes the fuzziness of the brightest parts of the image. Chroma Offset X, Y moves the brightest parts of the image on their X (horizontal) or Y (vertical) axis. Frame Jitter controls the amount that the entire frame wriggles around during the transition. Skew adjusts how distorted the imagery becomes. Monochrome removes all saturation from the footage supplied during the transition. Frame Style determines if the frame is preserved (Original), or restricted to 4:3 (a standard during the VHS era).